Let's go over several green pest control tips that will do an excellent job of getting rid of miniature invaders without tainting your conscience or your home. They're inexpensive too! The first step for successfully getting rid of your insect invaders and keeping them out is to know what you're dealing with. “Bugs” aren't just bugs – different species have very different habits and food preferences. What works with some types of insects or ants might not work with others at all. 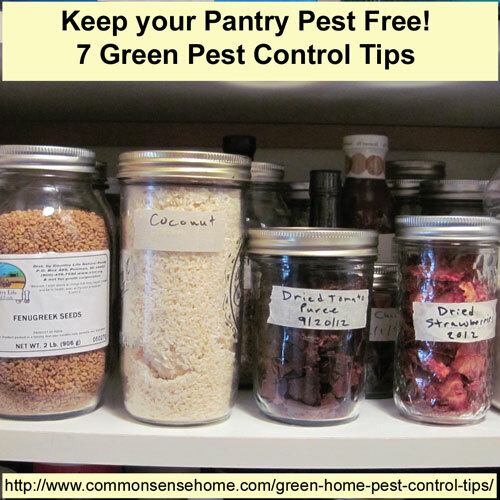 Top pantry pests include meal moths and various pantry beetles. You can find photos of common pantry pests at UC Davis and Cereal and Pantry Pests at PennState. If you can't find your bug in those images, take a photo of their nests or the insect and post the image on the internet in pest control forums or email it to someone with pest experience. Don't leave any organic garbage lying around to attract ants, wasps, mice and other pests like cockroaches. Look around your house and seal any cracks, holes, leaks or other easy access points that will let little critters get into your home easily. Seal off all your garbage in airtight plastic containers that can't be penetrated by even small pests. Making your home more pest resistant isn't a guarantee of anything, but it does reduce your chances of having an invasion happen. These will cost a little more, but if you're in a hurry, you can go ahead and use commercial green pest control products. Look for organic insecticidal soaps, pantry moth traps, citrus based sprays, clothes moth traps or other plant/essential oil based sprays. Cedar oil, also known as cedarwood oil, is an essential oil derived from the foliage, and sometimes the wood and roots, of various types of conifers, most in the pine or cypress botanical families. (source) Cedar oil can be used as a backyard mosquito repellant when burned – just like citronella. The liquid can be applied to household plants, used as a treatment in bedding or for bathing your pets. (Note: use only for large animals such as dogs, cats over 6 months of age, horses, cattle, etc – not for use with small animals such as hamsters, gerbils, snakes, etc.) It is effective against fleas, bed bugs, spiders and many other insects. Best of all, cedar oil smells nice and has no harmful effects on the skin. For your bigger, and probably furrier household pests like mice, rats, rabbits and snakes, you can use non-lethal traps to catch them without killing them and later release them far from your own home (be sure to also release them away from anyone else's house unless you enjoy being a bad neighbor). All sorts of non lethal traps are sold on the market, each for a different type of animal. There are special cages on sale for rodents and traps for creatures like snakes and small reptiles. A small amount of vegetable oil based (castile) soap to a two gallon bucket of water will create a completely non toxic, easy to use ant killing solution. Mix the solution thoroughly and either pour it along patio areas where you have frequent ant infestations or use from a spray bottle to control ants and other small insects wherever they appear. Be sure to use castile soap that contains fatty acids from vegetables since it's the most chemical free and safest for home use. You'll hardly find a cheaper solution to ant infestations. Instead of resorting to all sorts of different chemical repellants to get keep insect pests away, you can try out a large variety of different home remedies that are based on foods or commonly bought plants. Ants hate citrus oil and coffee grounds; both can be used in strategic entry locations to repel the little insects from your home's interior. For sugar ants – mix 1 tablespoon of sugar with 1/8 teaspoon of borax. Add enough water to make a syrup. Place about a teaspoon of this mix on something like a flat lid in the affected area, but out of reach of pets and children. The ants will carry the syrup back to the nest and eliminate it. Borax is not dangerous in very small amounts, but you wouldn't want kid or critter eating it in quantity. Deter fruit flies by applying a small wad of of crushed mint leaves to window entrances and near doorways. Fruit flies seem to hate natural mint. Cut off cockroaches with catnip – Add a small amount of dried or fresh catnip to some water and steep it as if you were making tea. Cool, strain and place in a spray bottle. Apply wherever your ugly cockroach problem is showing itself. Thanks for sharing these tips. We get ants in the summer and they are a pain. I’ll be trying out the citrus oils and coffee grounds trick for sure. You can mix cinnamon essential oil in a spray bottle with water and wipe your kitchen counter tops to get rid of small ants. I used a 16 oz spray bottle and probably 15 -20 drops of the oil in it and three days later ( with a noticeable difference in between) the ants were all gone. A sprinkling of ground cinnamon will turn them around, but it’s messy and if they find a small break in the line, they’ll march right through it. All 7 tips of pest control are very helpful for everyone because this kind of problem occurs in their homes. I really like your tips –” Cut off cockroaches with catnip”. Thanks for sharing. Nice selection of tips, Soapy water is a favourite of mine it works a treat on ants and wasps. Catnip will only repel roaches driving them into a new micro habbitat or in to deep harbourage…in to your walls. You would be best served using light dustings of boric acid. Its all natural and very chep. As a bonus it lasts forever as long as it stays dry and is 100% lethal to exposed roaches in 3-15 days. Remember LIGHT dusting. Think of it as snow. If you see 12 inches of snow on your path you walk around it. Same thing a german roach will do. If you see 1 inch of snow you will probably just walk through it as will the roach. Now its exposed and on the way to meet his maker. I’m a commercial exterminator and would use other things but too keep it green go boric. If you freeze your flour for a few days before storing it, it will kill the weevil larvae that are in most flours. I also use bay leaves in my flours, grains and the like; do that for things in containers in the cupboard, too. Depending on the volume of bugs, you could stick the infested containers in the freezers until the critters die off, and then sift out the flours or grains to remove them (or just grind them up and use them – they are edible, just not appealing to most). There are also commercial pantry moth traps available, as mentioned in the post. What a great list of tips! We moved into a major fixer upper house a few months ago and did a major clean out and remodel since there were definitely some pests present when we bought it. I’m hoping we can keep them away now! Pest control is very important to keep home clean and healthy. These are really a good tips to eliminate pests from home in organic way. Pests are becoming a very common issues in home so these 7 green home pest control tips will be very helpful to eliminate pests easily and less expensive way from the home. Thanks for these great tips! Right now, the ants, tiny sugar as well as larger ‘regular’ ants are invading my home. I use a peppermint essential oils spray on them. Take an 8 oz spray bottle, add about 2 oz or so of peppermint essential oil and fill the rest with water. when you spray tiny ants, it kills them on contact. The larger regular ants will die quickly, but not immediately. I have used this for several years. this works when they are already here, but to kill them at the nest, use a boric acid/borax -water paste which they take to the nest and it kills them all. PS, the peppermint E.O water mix will also kill spiders, the larger they are, the more you have to spray them, but they will die. I have heard diatomaceous earth will also kill bugs, as it is like razor sharp spikes that shreds their bodies when they walk through it.